However, now that I have looked at the charts of some of the other contenders, I can draw some comparisons. For example, it is interesting that both Joe Biden and O’Rourke have three planets aspected by Jupiter. 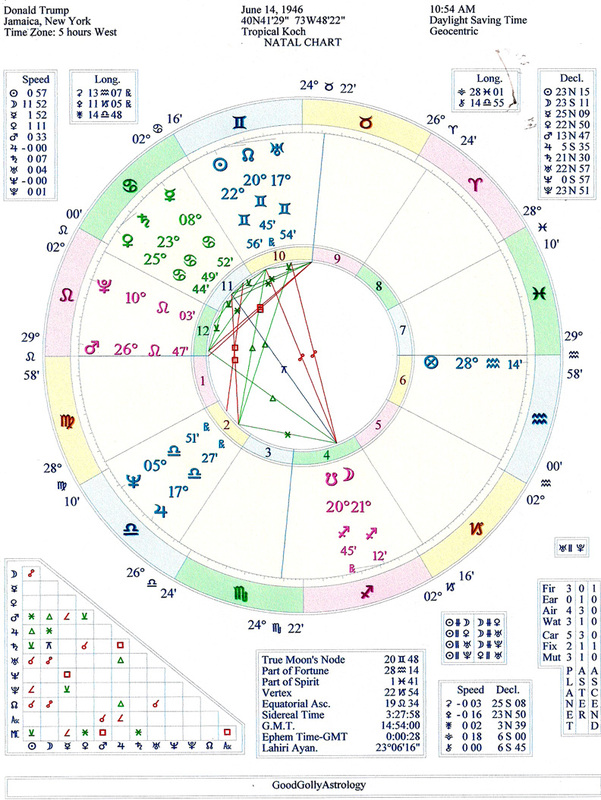 Biden has Mercury, the Sun and Venus trine Jupiter and O’Rourke has Mars, Pluto and the Sun square Jupiter. As I said in the article on Biden, this is a natural aspect for a glad-handing, always-happy-to-meet-you politician. I heard someone describe Biden as a master of “retail”, one-on-one politics. O’Rourke has the same gift. The fact that his aspect to Jupiter is a square provides more tension and a maybe a little bit too much self-confidence. On the other hand, with the Sun in friendly Libra, O’Rourke’s version of retail politics is more about charm and less about shoulder rubs. The last three weeks have been pretty awful for Donald Trump. There was the Cohen testimony which gave people a first hand look into Trump’s personality and business practices, 80 some subpoena’s issued by the House Judiciary Committee targeting Trump’s finances, his presidential campaign, his inauguration and much more, the failure of his summit with Kim Jong Un, reports that North Korea has renewed construction of nuclear sites, a record budget deficit and a sharp increase in our trade deficit. And yet, Trump’s poll numbers have remained steady and the president has never appeared more confident. What’s going on in Trumps horoscope? Jupiter. (Click on Donald Trump to the chart.) About three weeks ago Jupiter began a conjunction with Donald Trump’s natal Moon. Since the Moon is in a close opposition with the Sun in his chart, Jupiter was simultaneously opposed to his Sun. Usually Jupiter aspects go by quickly, but Jupiter is approaching a period of retrograde which slows down its apparent motion. People tend to think of Libras as people-pleasers who avoid conflict at all cost, and it is true that Libra people typically favor peaceful coexistence. However, Libra is the sign of the scales and people born with this Sun sign are always seeking balance. 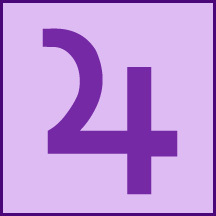 When they encounter a situation that they regard as out of balance or unfair, Libras will argue and argue strenuously until the perceived inequality is corrected. 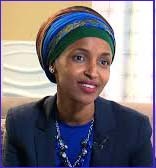 We saw an example of this two weeks ago when congresswoman Ilhan Omar objected to what she saw as favoritism in U.S. foreign policy toward Israel and undue influence by Jewish lobbying groups on congress. She has complained about this in a series of tweets that offended a lot of Jewish and non-Jewish people who saw her remarks as anti-Semitic. 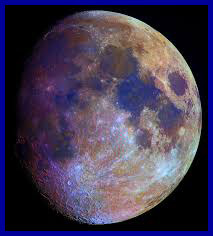 As I suspected, the chart for the last Full Moon (on Feb. 19) was not nearly a peaceful as it first appeared. (Click here to see the article and the chart.) Since the Sun was in the Tenth House the focus was on our leadership, in particular on our president. The accusations raised by Michael Cohen against Donald Trump in congressional testimony are hardly new, but the fact that they were made by someone who had been so close to Trump for so long gives them new substance. This has created a lot of talk, but still no action. Meanwhile, the scandal I mentioned in that article popped up in a totally different arena when Robert Craft, the owner of the New England Patriots, was charged with soliciting prostitution in a Florida massage parlor. I had said that, since Venus was involved, the scandal would involve either women or money. As it turned out, it was a bit of both. I failed to consider Trump’s summit with Kim Jong Un in that article, however the conjunction of Mercury with Neptune in Pisces seems to sum up how it turned out. Both men entered with big hopes and (and as often happens with Neptune) both men left profoundly disappointed. The conjunction was in the Eleventh House, which is associated with friendship. I wonder if Donald and Kim will remain buddies after this.